As you can see, it can be a very difficult string to construct properly. In addition, if you are updating the certificates for the appliance, the PEM files must be formatted into a single line string with appropriate embedded newline characters. This can all be very challenging and intimidating when attempting to deploy Access Point. That is why I wrote this utility. It basically acts as a GUI wrapper for the OVF tool and will construct a proper OVF Tool input string including all of the JSON to be passed to the Access Point API. Access Point functions as a secure gateway for users who want to access Horizon 6 desktops and applications from outside the corporate firewall. Access Point appliances typically reside within a DMZ and act as a proxy host for connections inside your company’s trusted network. This design provides an additional layer of security by shielding View virtual desktops, application hosts, and View Connection Server instances from the public-facing Internet. Access Point directs authentication requests to the appropriate server and discards any un-authenticated request. The only remote desktop and application traffic that can enter the corporate data center is traffic on behalf of a strongly authenticated user. Users can access only the resources that they are authorized to access. An Access Point appliance can be configured to point to either a View Connection Server instance or a load balancer that fronts a group of View Connection Server instances. This design means that you can combine remote and local traffic. Configuration of Access Point is independent of View Connection Server instances. Unlike with security servers, no pairing password is required to pair each security server with a single View Connection Server instance. Access Point appliances are deployed as hardened virtual appliances, which are based on a Linux appliance that has been customized to provide secure access. Extraneous modules have been removed to reduce potential threat access. Access Point uses a standard HTTP(S) protocol for communication with View Connection Server. JMS, IPsec, and AJP13 are not used. My colleague Mark Richards has also written a great article, with a very detailed overview of Access Point, along with how deployment works with the OVF Tool and using the API. As mentioned earlier this utility is a wrapper for the VMware OVF Tool. It allows you to input settings in a GUI and it will create the properly formatted input string for you. It also allows settings to be saved to an XML file and later imported to reduce how much data needs to be manually entered. It will also take a standard PEM certificate chain and private key and convert them to the proper format. When you first start the application it reads the registry to see if the VMware OVF tool is installed and it reads where the tool is currently installed. If it is not detected, you will see the message below and you will need to install the OVF Tool to continue. If you have previously exported settings, you can import them to populate the form by choosing “Import Settings from XML” and browsing to an export file. This is a quick way to import your settings for redeployment. The only settings that aren’t saved are passwords. Let’s assume you don’t have any settings exported and you are running the application for the first time. We will go through all of the parameters and provide information on what they are and how they should be formatted. These are the basic settings required to deploy the Access Point appliance. Let’s go through each of them now. Note that each setting has a button that will show example format. This setting is case sensitive! VC Password: The password for the user you specified in the previous step. Use a management IP? : This option is automatically selected if using two or three nics. Use a back-end IP? : This option is automatically selected when using three nics. Configure View Settings During Deployment: Checking this box will enable the panel containing View Settings which will be passed into the appliance API via JSON and set during deployment. Configure Certificates During Deployment: Checking this box will enable the panel containing certificate settings which will be passed into the appliance API via JSON and set during deployment. External Network: The network label as defined in Virtual Center / vSphere for the port group you want to assign to the external interface. If using just one nic, this will be used by management and back-end traffic as well. *Note: Access Point is not properly accepting multiple DNS entries (event when deployed via vCenter). In SUSE, multiple DNS entries should be placed on separate “nameserver” lines and they are being placed on a single line. This is a known issue and at this time you must use a single DNS IP Address. This will be fixed in a future release of Access Point. Management Network: The network label as defined in Virtual Center / vSphere for the port group you want to assign to the management interface. If using two nics, this will be used by management and back-end traffic. Back-End Network: The network label as defined in Virtual Center / vSphere for the port group you want to assign to the back-end interface. Admin password: Password used to connect to the REST API. This password must be 8 characters long and contain at least one each of the following: upper case letter, lower case letter, number and special character ! @ # $ % * ( ) Example: VMware1! At this point, all of the required fields to deploy are complete, but let’s walk through the process of configuring settings for Certificates and View before we deploy. Certificates can also be configured at deployment. This is very important as the Access Point appliance is sitting in the DMZ and acts as a secure gateway for View. Certificates can be set by selecting the checkbox “Configure Certificates During Deployment”. This will enable the certificates panel. The certificate input boxes also have a button which will show proper format. The first thing you need to do is, to export the certificate you want to use for Access Point. In my case, it was the certificate I had on my View Security Server. 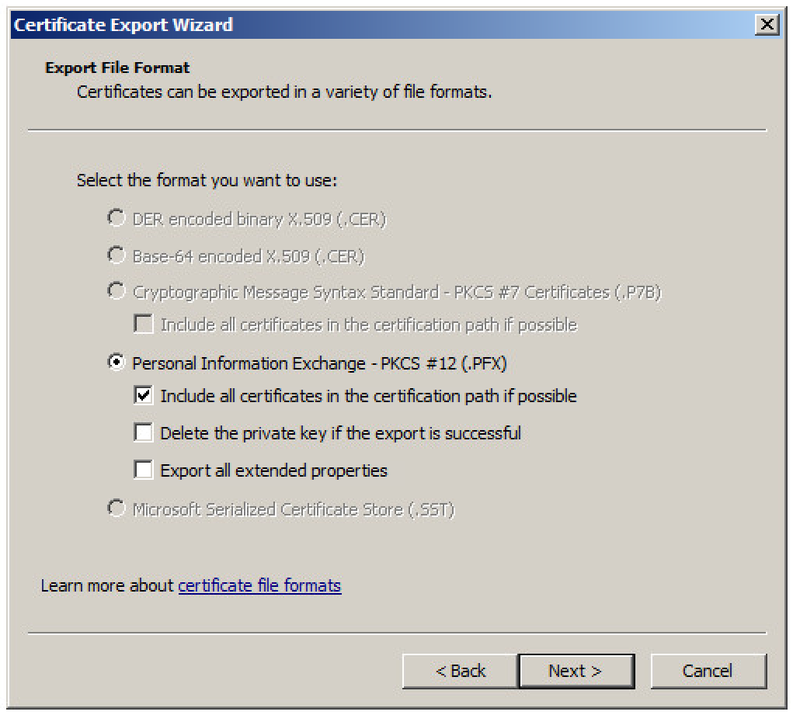 Select “Export all certificates in the certification path if possible”. This will make sure that any appropriate intermediate and root CA’s are exported. Create a password for the private key and save the exported certificate. Once you have the exported certificate, use OpenSSL to convert the certificate to a PEM certificate chain and private key by running the following commands. If you need to modify the Private Key or Certificate chain, simply click the “Update Private Key” or “Update Certificates” button and it will clear out the box so you can paste in a new string. This process will update the certificate on the Access Point appliance when you deploy it. This is much easier than having to go back in later and set it via the API. The primary use case for the Access Point appliance is access View desktops and applications. You can set all of the View configurations at deployment by selecting the “Configure View Settings During Deployment” checkbox and entering the proper information. Administrators must perform specific tasks to ensure that View Connection Server works correctly with Access Point. If you plan to use a secure tunnel connection for client devices, disable the secure tunnel for View Connection Server. In View Administrator, go to the Edit View Connection Server Settings dialog box and deselect the check box called Use secure tunnel connection to machine. By default, the secure tunnel is enabled on the Access Point appliance. Disable the PCoIP secure gateway for View Connection Server. In View Administrator, go to the Edit View Connection Server Settings dialog box and deselect the check box called Use PCoIP Secure Gateway for PCoIP connections to machine. By default, the PCoIP secure gateway is enabled on the Access Point appliance. Disable the Blast secure gateway for View Connection Server. In View Administrator, go to the Edit View Connection Server Settings dialog box and deselect the check box called Use Blast Secure Gateway for HTML Access to machine. By default, the Blast secure gateway is enabled on the Access Point appliance. To use two-factor authentication with Horizon Client, such as RSA SecurID or RADIUS authentication, you must enable this feature on View Connection Server. See the topics about two-factor authentication in the View Administration document. View Thumbprints: Specifies a list of View Connection Server thumbprints. If you do not provide a comma separated list of thumbprints, the server certificates must be issued by a trusted CA. The format includes the algorithm (sha1 or md5) and the hexadecimal thumbprint digits. To find these properties, browse to the View Connection Server, click the lock icon in the address bar, and view the certificate details. Note: The appliance will accept the the space delimited format from Chrome or the colon separated format from Firefox. NOTE – sha1 or md5 MUST be lower case! Now that all of the appropriate settings for deploying an Access Point appliance are in place, this is a good time to export out the settings that you have entered. Click the “Export Current Settings” button at the bottom left of the form and select a location to save the settings to. This will create an XML document with the values you had entered (with the exception of passwords) so they can easily be imported at a later date when deploying additional appliances. This string can be copied directly into the command line after the ovftool.exe for troubleshooting. Once all of the settings are in place, you are ready to deploy the appliance. Log Level: The ovftool log level can be adjusted prior to deployment by selecting the log level at the bottom right of the form. Once you have all of the required information set, you will see a dialog which shows the progress of the deployment process of the appliance. The data that is shown is the direct output from the OVFTool. We are going to review the logs to see where our settings are being applied to the access point appliance. NOTE: This same process is used for troubleshooting. If you notice the appliance is not responding and is CPU pegged, it is likely that an invalid parameter was passed in. This process will allow you to troubleshoot those issues as well. The first thing I test is to connect directly to the internal IP address of the Access Point appliance and make sure that it presents the appropriate View Connection server. This is a good way to test basic functionality of the Access Gateway without involving firewalls, etc. The final test is to connect to the external Access Point URL and verify that you are able to connect via all protocols configured (PCOIP, Blast). Congratulations! You have deployed the VMware Access Point Appliance! You can download the application below to test in your environment. Also, make sure you are not missing the Cluster name if you are using a cluster in your environment. This is a 1.x version of the application and I haven’t been able to test all scenarios. I would appreciate if others can test in their environments and provide issues, feedback and suggestions to me. Thanks! Fixed issue with Chrome adding a Unicode character (<u+200E>) at beginning of Thumbprint when pasted in which would hang appliance at startup. Fixed issue when not deploying all View options where those options were still set with invalid values and appliance would hang at startup. NO TECHNICAL SUPPORT IS PROVIDED FOR THIS PRODUCT. This entry was posted in Access Point, Horizon View Utilities. Bookmark the permalink. When I fill all the fields and “Deploy” it I get an error of the program right away: “Unhandled exception has occured in you application…”. So I clicked on the button “Show OVF Tool String” and used this with the OVFTOOL. The OVFTOOL succesfully deploys VM AP but the “View Settings” are not configured in the VM AP and it starts but won’t run service https (443) and 9443. I know this because when I’m using the OVFTOOL just with the minimal settings (so no View Settings like External URL for Blast and Accesspoint) it works. You can either dig into it by doing “less /opts/VMware/gateway/conf/firstboot.properties” and deleting the 0x203 characters in the certificate Thumprint and reboot. Or re-deploy with omitting the prevailing 0 in your copy and paste job. *Or re-deploy by omitting the prevailing “space” in your copy and paste job. I had an issue using this utility on DNS entries. In entered all the information exaclty as specified and after long hours of investigation I realized DNS resolution was not working at all on the appilance. DNS IPs that I entered comma separated were not registered properly in /etc/resolv.conf. so if you use this utillity, I advise you to enter only one DNS IP and thhen adjust those ones manually through the console as root. Chris thank you very much for this utility, despite this inssue I was able de redeploy around 20 times the appliance during this troubleshooting with fewer effort. I have seen this issue as well. It actually isn’t limited to this utility. The same thing happens when deploying via vCenter, OVFTool manually or through this utility. It appears to be a known issue with Access Point and I will update the post when there is a resolution. In the mean time, I will limit the next version to one DNS entry in the GUI until the issue is resolved. @ThybCD Thank you, that was the problem here also. @chrisdhalstead Thank you for this awesome tool. I have implemented the certs fine and it looking perfect in the webrowser. But if I open the connection with the Horizon Client on Windows (build 3.5.2) there is still a message, that the connection is not trusted. How can I fix this? Thanks Simon – Check the Horizon Client cert checking mode. This is under the drop-down menu at the top-right of the client under “Configure SSL”. If it is set to “Do not verify server identity certificates” you will always get the red X, even if it is a valid cert since it isn’t checking it. Make sure it is set to “Warn before connecting to untrusted servers” or “Never connect to untrusted servers” and you should see the green check box. Great post, does Access Point work with Cloud Pod Architecture?